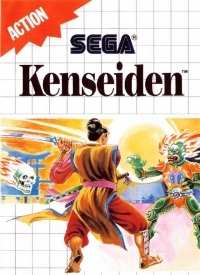 Description: Kenseiden is a one-player game that comprises of sixteen levels. Each of the levels are side-scrolling, with bamboo houses or dank, haunted caves as their backdrop. 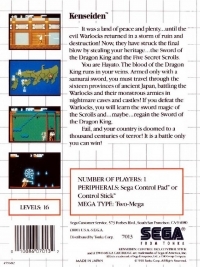 These levels see Hayato beseigned by ghosts, skeletons, and other spirits of the supernatural. On his side is his curved sword, which he can swish at will against the monsters. If Hayato comes in contact with a monster, he will lose some life. Box Text: It was a land of peace and plenty...until the evil Warlocks returned in a storm of ruin and destruction! Now, they have struck the final blow by stealing your heritage...the Sword of the Dragon King and the Five Secret Scrolls. You are Hayato. The blood of the Dragon King runs in your veins. Armed only with a samurai sword, you must travel through the sixteen provinces of ancient Japan, battling the Warlocks and their monstrous armies in nightmare caves and castles! If you defeat the Warlocks, you will learn the sword magic of the Scrolls and...maybe...regain the Sword of the Dragon King. Fail, and your country is doomed to a thousand centuries of terror! It is a battle only you can win! 01-29-2016 Flashback2012 Box Text It was a land of peace and plenty...until the evil Warlocks returned in a storm of ruin and destruction! Now, they have struck the final blow by stealing your heritage...the Sword of the Dragon King and the Five Secret Scrolls. You are Hayato. The blood of the Dragon King runs in your veins. Armed only with a samurai sword, you must travel through the sixteen provinces of ancient Japan, battling the Warlocks and their monstrous armies in nightmare caves and castles! If you defeat the Warlocks, you will learn the sword magic of the Scrolls and...maybe...regain the Sword of the Dragon King. Fail, and your country is doomed to a thousand centuries of terror! It is a battle only you can win! This is a list of VGCollect users who have Kenseiden in their Collection. This is a list of VGCollect users who have Kenseiden in their Sell List. This is a list of VGCollect users who have Kenseiden in their Wish List.